Driving a sports car on slippery roads in wintertime is definitely not a smart thing to do, but can be fun if you know how to handle the adrenaline-stimulating horsepower from a turbocharged engine. And the advanced safety features of the latest sports cars to hit the market, including GM’s all-new Camaro and Mercedes-Benz’s 400 d 4Matic, ensure a driving experience that’s fun but not terrifying. 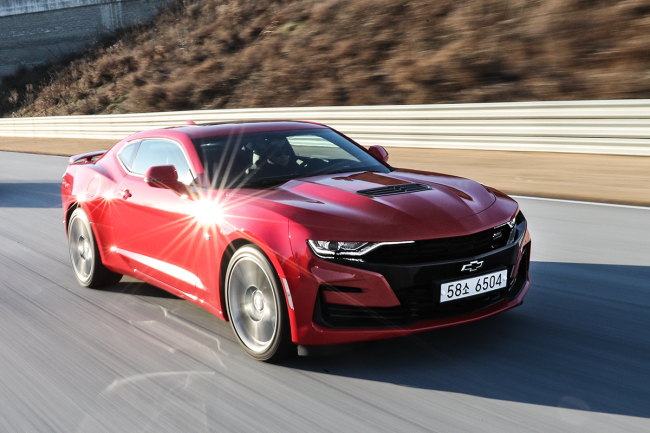 As GM Korea CEO Kaher Kazem described it, the New Camaro SS inherited Chevrolet’s performance DNA as the original American muscle car, but the company has transformed the vehicle to attract a wider range of customers, including female drivers. Its body is smoother, with more sophisticated lines, and the colors, especially a shade the company calls Flaming Red, will blow the minds of young and adventurous women. Inside, the New Camaro has sporty jet-black punched leather seats in darker surroundings that aren’t especially entertaining, which gives you an idea what the vehicle is really about -- explosive performance. 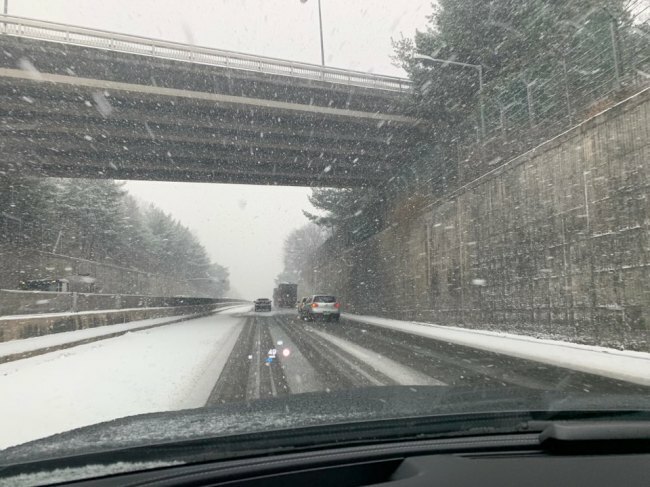 The American racing machine was introduced to South Korean media last month at the Yongin AMG Speedway, but test-driving the car on the racetrack was impossible that day due to heavy snow. Instead, auto writers were given short demonstrations with professional race car drivers running in zigzags and showcasing a really short version of drift racing. The session may have lasted less than 30 seconds, but one couldn’t help but instinctively look for a handle to grab onto for balance -- something the New Camaro SS does not have. The power from the 6.2 liter V8 engine -- which produces horsepower of up to 453 and up to 62.9 kilogram-meters of torque -- was intense, and so was its sound. But the brakes, while they worked well, screeched unpleasantly throughout the entire process over the driver’s insistence that it wasn’t always like this. The original American muscle car comes with high-tech features such as magnetic ride control, which checks road conditions over 1,000 times per second to control damping, the high-performance Brembo system and the torque vectoring system, which optimizes cornering control through rear wheel brakes that work independently, the company explained. Through the custom launch control system, which includes a line lock, the New Camaro SS reaches from zero to 100 kilometers per hour in only four seconds. For the safety of passengers, the racing machine is equipped with eight air bags, as well as blind spot alert, lane-change alert and rear-cross traffic alert functions. The New Camaro SS is priced between 54.28 million won and 55.07 million won. If the New Camaro SS is a rough diamond that shines inside but requires some advanced driving skills to truly make it a race car, its European competitor, the Mercedes-Benz CLS 400 d 4Matic, is a sports car that felt like a glass of full-bodied red wine. Living up to its slogan, “Designed to seduce,” the third-generation CLS is a racing/luxury sedan that is elegant in design but enthusiastic in performance. 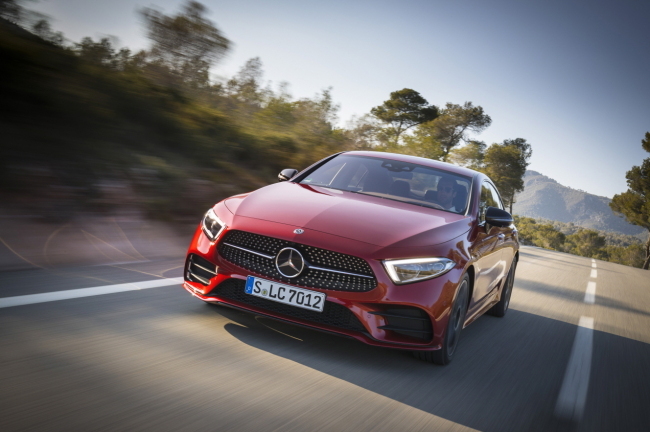 The four-door coupe keeps its signature swooping roofline, and its front grille got wider toward the bottom, while continuing its design flow with the “shark-nose” front fascia. The height of the vehicle is quite a bit lower, reminding one to lower the speed when a speed bump is in sight. Inside, fantasy is the word that came out first upon seeing the wide, flat central display in place for infotainment with an abundance of ambient lighting throughout the interior. It has high-tech design elements, providing tradition and modernity all at the same space, but the two blend together in a way that’s surprisingly natural. The 3.0 liter diesel-powered vehicle didn’t immediately unleash its power -- up to 340 horsepower and up to 71.4 kilogram-meters. It did so gradually, enough to feel its high-performance DNA but not so young and furious like GM’s New Camaro. The biggest change of the revamped third-generation coupe is the five-seat interior, instead of the previous four-seater, catering to drivers looking for a family car. The price tags for the CLS 400 d 4Matic and CLS 400 d 4Matic AMG Line are 98.5 million won ($875,500) and 107 million won, respectively.